Oh, activity bags, how I love thee, let me count the ways . . . I first discovered the concept of activity bags around the time my twins were born. We had just moved, I was hugely pregnant, on bed-rest for awhile and then tending to newborn twins who were nursing around the clock and mostly only sleeping in arms. I also was trying not to rock my two-year-old’s world any more than possible (fat chance!). 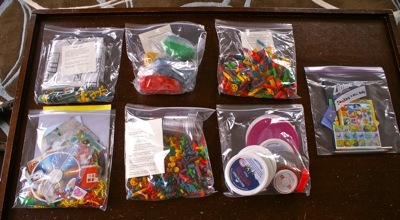 The main idea is that you assemble or make a self-contained activity that fits into a small bag. When you need a quick (or long) activity to occupy your bored or busy kid, you bust it out! Some are great for on-the-go, airplane or car rides, at the doctor’s office, etc, while others are a bit more messy and best for home. These can also work great for homeschoolers — and you can obviously cater the contents to any age, topic and ability level. So when I happened upon a toddler activity bag exchange with 12 other moms across the country (via an online parenting forum I frequent), I jumped at it! We agreed to some guidelines (one activity had to fit into a gallon ziplock, 12 activities had to fit into a flat rate priority mailing box, we couldn’t spend any more than $20 for all the bags combined, etc) and then got to work. I chose something easy that I knew I could do sitting down — homemade mini-books and stickers. Once they were assembled, I sent them off, and in a few weeks a box with 12 different activity bags landed on my doorstep. Jackpot! I kept them in a tub by my chair in the living room and would pull one out whenever Emma needed a new activity. I made sure to not keep them out all the time, so they stayed “fresh.” It worked so well, I ended up using the concept with various other of our toys and activities — I think this probably was what spawned my toy rotation plan a bit later! Recently, I made activity bags for my twins club auction and for a friend-in-need’s toddler. Many of them are so easy to assemble! Others take a bit more work, but if you do it in bulk it feels pretty productive. I did 7 bags: colored pasta beading, colored pasta sorting, mini-books and stickers, lid sorting, playdough, cut and glue collage bag, and mini-playmats with cars and things. Dyed Pasta for beading and sorting: A pretty easy project, detailed here, that allows you a bunch of projects in one. First is general playing with and sorting of the pasta — greens with greens, same shapes with same shapes (or whatever your little ones think up! ), or counting and matching pasta to numbered cups. You can also glue the pasta onto paper or cardboard for a fun art activity! Then there is pasta beading — if you find the right type of pasta (with big enough holes and no big bends) then the kids can thread it onto a string and make a necklace. Playdough: Emma and I just whipped up 4 batches of Grandma Cynthia’s awesome playdough recipe! I divided each batch in half for two sperate bags, separated the colors in small bags within the larger ones. Combine in saucepan. Gradually stir in gradually 1 cup water mixed with 2 tablespoons oil and 1teaspoon food coloring. Cook over medium heat until a ball forms. Knead until smooth. Add glitter during kneading if desired. Mini-books and stickers: this one is pretty self explanatory. Kids love little books their size to write and draw in, adding a big assortment of stickers makes it even more fun. I use plain white computer paper for the inside of the books (recycled would be ideal! ), colored construction paper for the outside, staple and cut them in 4-5 different orientations and sizes. Adding in some short little library pencils (or colored pencils) in the bag is great, too. Just let them play! Lids can be cookies, pies, cakes, plates, frisbees (gulp) or ???? 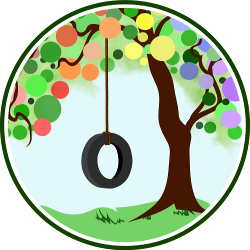 With younger kids, let them explore while you narrate or talk with them about what they are doing, seeing & feeling (using words to describe color, size, texture, materials, etc). Use different sheets of colored paper, string circles, bowls or tubs to create different areas to sort the lids. Sort by color, size, words or no words, what the words say, etc. This can get more challenging to match your child’s skills. Stack or “nest” lids by size from big to small — its fun to see which ones will fit. See if you can find any matches! Collect more lids and play a matching game where one person chooses a lid and the other finds the match. Mini-playmat and toys: This one is awesome! So awesome, in fact, I gave it its own post. In a nutshell, I took an idea I saw on Filth Wizardry about making a playmat out of a shower curtain, and scaled it way down (using a cut up phalate-free curtain, to avoid the icky fumes!). Making it out of fabric would obviously be more earth-friendly (but probably less easy to color). A few other ideas of things I’ve made, received or seen elsewhere: mini feltboard and shapes or face parts, cars and fabric and velcro tracks, muffin tin crayons, collections of small things to sort, sandpaper boards & yarn art, dry bean sensory play, I-spy bags, laminated play mail, homemade picture puzzles, “stained glass” (tissue paper) art, magnet collection, mini “memory” game, clothes pin color matching, lacing cards, beanbag toss . . . the list really does go on and on! There are tons of ideas out there online, as well, if you look for them: check out Tried & True for some gorgeous pictures of her activity bags (and great links), and My Delicious Ambiguity for a the MOTHERLOAD of “Busy Bag” ideas, including this awesome Linky featuring a whole ton of activity bag posts! Thanks to these mamas and to all who continue to inspire me — I am planning a bunch more acitivity bags for my girls very soon! Have you tried activity bags, or do you do something similar? I’d love to hear what your favorite activities are — I am always looking for new ones to try! This article has been edited from a previous version published on Intrepid Murmurings. All photos credited to the author. 18 Responses to Toddler and Preschooler Activity Bag Fun! This is perhaps the most brillant idea ever! I am so making a couple of these for our annual vacation this summer. The small size of the activities will be perfect for the great grandparents houses and hotel. Thank you! Thank you! Yes, they are really great for travel! I often grab them now for long car trips, for Drs office waits, or to entertain my little ones during big sister’s classes. If we ever brave air travel with our girls, I will definitely be bringing a bunch! LOVE this! My mom was a kindergarten teacher and these remind me so much of things she had when I was little. What fun ideas. I’m definitely going to have to make some of these bags! I taught kindergarten too, and these are very similar to the kind of activities I would have for my students. If you make them, come back and let us know how they work! I love these ideas so much, particularly the idea of a activity bag exchange. I am bookmarking this post so I can come back to some of the wonderful ideas here and linked up to the post. We have many road trips planned in the coming months, I can see where these activity bags would be great. These are awesome. I’m asking my friends to do a swap with me. Doing a swap is the best way to get a bunch! It’s pretty easy to make a lot of the same thing, and AMAZING to get a whole bunch of other fun activities from others. Do it! Awesome ideas! Our local library also has Activity Bags that include a book and an activity to go with it. I know I did one that was about counting money and it had a set of plastic coins with it. This would be a good way to find a rotation of activity bags, if your library offers them, too. Fantastic! Thanks for so many great ideas and links. I search all the time for activities to keep my 2yo happy and engaged and I’ve found plenty here…now to the shops for those playdough ingredients…Yippee! I love these ideas for my young toddler! A few years ago I ran across it for my now-5 year old. I even tried setting up a swap but got exactly zero interest. Where do you find these opportunities to participate in a swap? I’ve been on the look-out for close to two years and haven’t found any! Aw, sorry you haven’t found a swap group yet, MrsH! I did my first one with a crafty group of folks on an online forum I belong to — so for that one we were all over the country and mailed them to one person who then mailed them to everyone. I am thinking of doing one with my local AP group, which has an active mailing list, but will be able to get together to distribute. Both were/are groups with a fair number of crafters/do-it-yourselvers, which helps (but is not necessary, since these really don’t have to be fancy!). Good luck! It’s not too bad to make your own, too, though, and then you get what your really want! Hi Carla! Welcome to Washington! I’m here in Seattle, where are you? I helped organize a swap last spring with our local AP group, and there was TONS of interest (enough for two swaps!). I am not interested in doing another right now, but if AP is your thing you may want to check out the Seattle API group (they have an active mailing list on Yahoo) but just googling should pull it up). There may be others that are interested on there again! Good luck, it is fun! this is perfect for my 4yr. old. when i have my nursing sessions with my youngest, i can have my oldest son dig around in something like this =] brings back memories of when i was a child. i had something like this! about to hit the dollar store up!!! oops, a bit new to blogging other people’s pictures and I just popped yours on my blog (with a link). Hope this is ok, please let me know if not and I will take them down (and ensure I ask before next time). Yep, that’s fine, but I appreciate you asking! Hope you have some fun making and playing with some activity bags…or find a swap! I’m about to start some for a big sister to some new baby twins! Kristin, I know it’s long ago now, but wondering what age range you’d set that pasta bag for? Also, how do you dye pasta without getting it mushy?